Re-branding is a serious decision. When it is done correctly and for the right reasons it can be one of the most rewarding and valuable investments that a business can make. Unfortunately, re-branding is not without its risks. 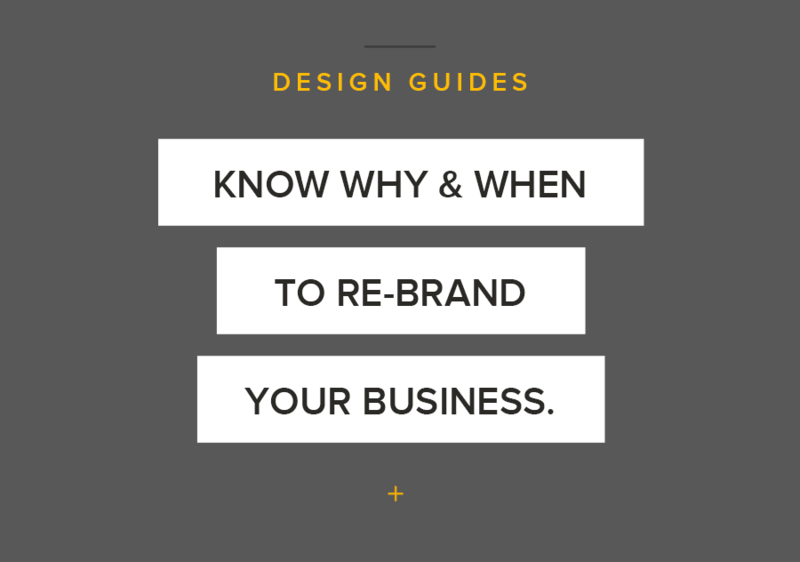 To make the decision less daunting, there are a few ways to know if it’s time for you to re-brand. It will also help you decide what approach you should consider taking with your new identity. Before we get started it’s worth spending a minute to understand what a brand is. Every business, product, place and even person essentially have one. Simply put, a brand is the perceived idea or impression that something creates in the minds of others. When a brand is working well the impression you make aligns with your core & business goals to create a message. Having a designed visual language for a brand gives you the ability to direct this message to the right market leaving a lasting impression. So what are the good reason to re-brand? Your brand simply isn’t unique or memorable. If your brand isn’t creating a lasting impression on your market and is easily forgettable it isn’t doing its job. If your brand isn’t unique it will be overlooked. Change in direction or products. If the fundamentals of a business are changing then it’s likely your old brand will not suit your new direction. This is a prime reason to re-brand with a new focus. A business has expanded or evolved into a new market. This a positive situation to be in. Re-branding while in this stage will help propel you into the next stage of the business while making it clear to your market that good things are on the horizon for your business. To disassociate from a bad reputation / negative image. This is a tough position to be in if the negative image is of your own doing it’s best to work with a good PR plan to get you through this and in some instances it can boost a brand. If you have exhausted your options or the image is out of your control, re-branding open and honestly will make a huge difference. New owners & new visions. If you’ve taken over a business and you have a different or bigger vision for the business then a new brand is ideal. Just make sure you don’t alienate existing loyal customers. Be open and honest about the change and turn it into a positive marketing opportunity. The brand has become dated or isn’t current. This isn’t always the best reason. Trends come and go and most big brands evolve over time but this might not mean your whole brand is wrong. With the right insight, you can see your brand revitalised. What are the not so good reasons to re-brand? Change of address/location. If your brand is working for you, but you change location, there is no reason why you can’t make the brand work in a new market. In fact, having an established market will show your brand is trusted. You’re bored of your brand. It’s easy to get bored of looking at the same logo over and over but having brand recognition is something to strive for. If your market isn’t bored with your brand stick with it. New owners with the same visions. If you’ve taken over a business it’s tempting to put your own personal touch to the brand, but you need to make sure the brand isn’t a key factor in the business’ success. If you’re trying to keep the same market, keeping the trusted brand might be the best option. The brand has become dated or isn’t current. Yes, this is in both the groups. Just because a brand isn’t following current trends it doesn’t mean that it’s not right for your clients. What are your options and what ones right for you? It’s not possible to create a list that covers every situation, but a re-brand will fall within one of the following 4 categories. 1) Tweaking the brand, not the logo. In some cases a logo is not the thing letting a brand down, it can often be the rest of the marketing material and how the brand is presented. This is best suited when your brand is flat and failing to capture your market but the logo itself is strong. A great way to spice up a brand is to look at introducing additional visual devices that work with the logo but can extend it to create something fresh and engaging. 2) Evolve the logo, expand the brand. This is one of the most common uses of re-branding. Some of the world’s biggest brands are experts at this. It generally means noticeable changes that still visually remind us of the previous brand. If your business is growing and moving ahead but is still targeting the same core market with the same message this is the right option. As shown above, a good example of this is the Bailey Homes re-brand, the colours in this design are the same, the typography feels the same but slightly updated and the overall concept and story in the design are the same. 3) Overhaul a brand but create a connection. Refreshing your brand in this way means that you utilise some parts of the existing brand to create a connection to the previous logo. This can be done with colour, type or something subtle. This is perfect for brands that are expanding or moving forward. Shown above the CleanEasy update shows a connection to a longstanding brand by use of colours and strong type. It expands on the “fun” nature of the original logo while giving it depth for the future. Sometimes your current brand is not going to suit your new direction, and sometimes if you’re honest, no one is paying attention to your current brand. If your core message and vision are no longer the same then there is no benefit in holding onto the past, so take advantage of the opportunity to get things right. 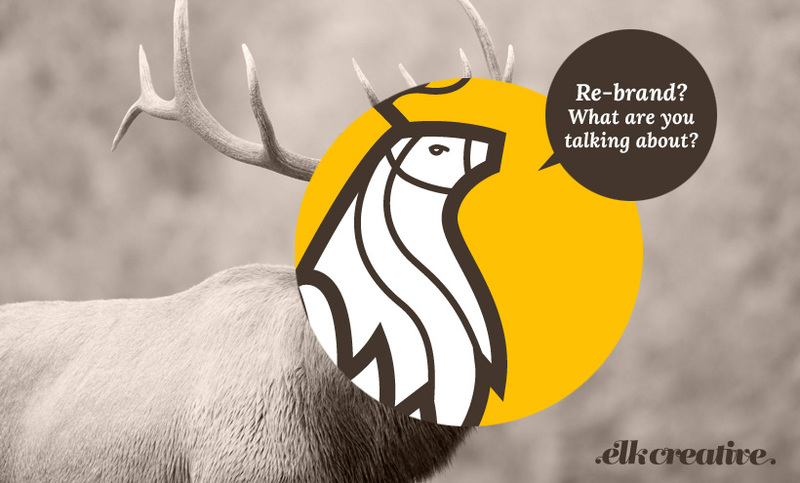 Shown above the Elk Creative new brand shows no real ties to the old logo and clearly captures a new direction for the business. Brands can change, evolve and even mean different things to different people, so make sure you’re in control of your business’ image.